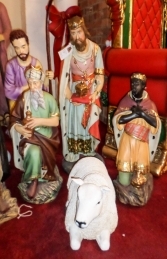 King 3 for your nativity set which is part of the 2ft series, a great addition for your Christmas display for churches, shopping centres and gardens. PLEASE ORDER EARLY FOR CHRISTMAS AS DEMAND FOR THIS MODEL IS HIGH. 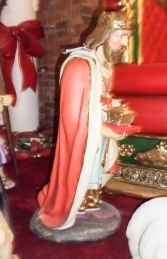 King 3 standing in his red cloak holding a cushion which has his gift sitting on for Infant Jesus. 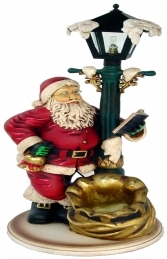 This model is ideal for all businesses, pubs, restaurants, coffee shops, adventure golf courses, children’s farms, zoo’s, theme parks etc to decorate and promote Christmas events, activities and parties or this would even look fabulous in your own home or garden for a Christmas display to outdo all the neighbours.